The Academy Awards this year are arguably the most diverse edition of the awards yet, with a lot of films about different cultures being nominated. Out of the films that are nominated for Best Picture this year, any of them could win the top prize. Two of them are surprise hits: Green Book and Alfonso Cuarón’s latest film Roma. The film has so far won two Golden Globe Awards and four Critic’s Choice Awards, including Best Picture for the latter. When I watched the announcement of the Oscar nominations this year, I was surprised to see this film receive the most with 10 nominations. 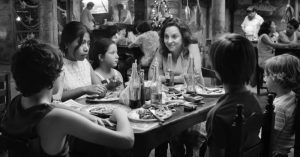 In the semi-autobiographical Roma, Cuarón goes back to his childhood and explores Mexico during that era. The year is 1970 and Cleodegaria Gutiérrez (Yalitza Aparicio) is a maid for Sophia (Marina de Tavira), Antonio (Fernando Grediaga), and their family in a neighbourhood in Mexico City called Colonia Roma. When Cleo works, she is with the family the entire time, even during their private moments. Meanwhile, she becomes pregnant after a date with her boyfriend, Fermín (Jorge Antonio Guerrero). We then follow Cleo and the family she works for through a tumultuous year. Before watching the film, I watched the preview of it when the film was highlighted on the Netflix main menu. This preview showed the awards it won and the many great reviews it received. After watching the movie, I can agree that it deserves its accolades. The film is presented in black and white, which gives it a French New Wave look, and it evokes nostalgia for Mexican cinema in the 1970s. It has an upstairs-downstairs aesthetic because Cleo and her co-worker, Adela (Nancy García), live in a house next door to the family’s house. When the family goes outside, the maids stay in a separate room. When they eat food, they go to a restaurant specifically for staff. 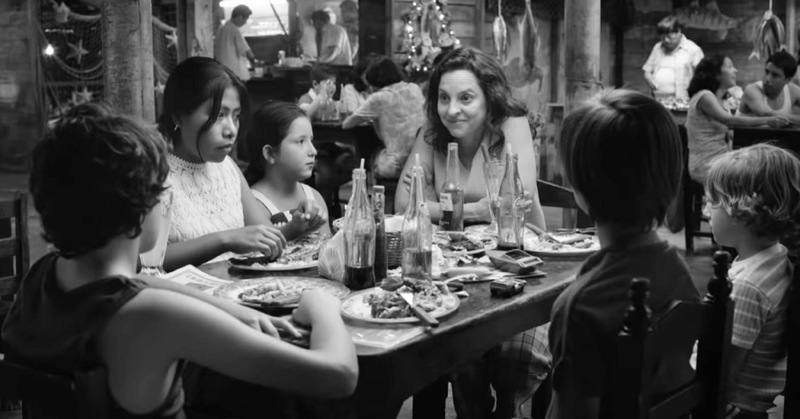 Roma was filmed near Cuarón’s family home, and one of Sophia and Antonio’s children is based on his own childhood. Although this is a TV movie for Netflix, with a limited theatrical release, it is an epic that deserves to be seen on the big screen. Also, if you are watching the film at home, you should watch it in 5.1 surround sound with a great home theatre system because sound is very important in the film. When someone is in the side of a shot, they sound muffled through those speakers. Cuarón does a lot of one-take shots in his films. In some scenes he does 360-degree shots to follow a person and show what else is happening simultaneously, as well as incorporating tracking shots. Compared to the films that he worked on with Emmanuel Lubezki, such as Gravity (2013), Cuarón’s cinematography in Roma is smoother. In one scene, Antonio spends almost two minutes trying to park a car in their garage. The most art-house cinema scene in the film involves a party where one person sings a Norwegian New Year’s Eve song while everyone else at the party puts out a wildfire. Currently, Roma has a 96 percent rating on Netflix. It could be the first TV movie to win Best Picture at the Academy Awards. Roma is available now on Netflix and is also showing in the Vancity Theatre until February 25.